Autumn is so rapidly replaced by winter and the leaves almost perceptibly rot away into nothingness. But decay itself has a beauty. Walking familiar paths weeks after the leaves fell to earth there are images to be found. Leaves create their own compositions in a deathly embrace. 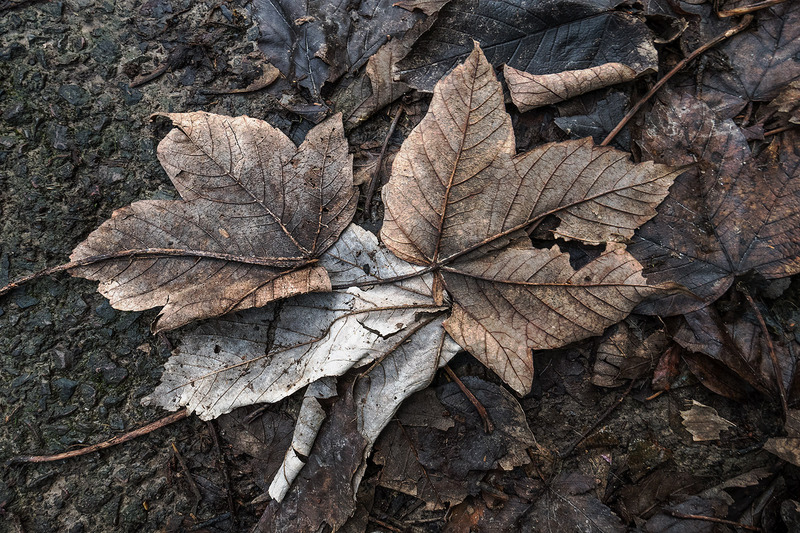 This entry was posted in Autumn and tagged Autumn, Fall, Leaf Litter, Photography, Sycamore leaf. Bookmark the permalink. We’re on the same page, clearly, Paula. So many colors and textures. I especially like the way the primary leaves seem to divide the image between more decaying leaves on the right, and the bare surface on the left. The one curled leaf edge is a perfect grace note. It’s really an appealing photo. Thank you Linda. A narrow palette but sill a wide range of colour and tone as you say. I spent quite a lot of time last autumn staring at the ground and this ‘patch’ instantly caught my attention – entirely nature’s composition, nothing added and nothing taken away. Lovely photograph, and your last sentence is a poem. This is what I’ve been looking at lately, and photographing, to an extent. I really like not only your photograph, which is beautiful and calm, but your writing, too. The leaf veins seem painted or drawn, such nice texture and light. Last Autumn was the first year when I really concentrated on the leaf litter as opposed to just noticing it, and there is so much beauty to be found if you spend the time studying the ground and searching for an arrangement of leaves. Patience is rewarded! Seen through an artist’s eyes, everything has beauty. You’ve certainly proved that here, Andy. We are never far from something beautiful, in my opinion. What a beautiful philosophy! I couldn’t have articulated it so well, but I do share your opinion.